Thursdays after 8:30 p.m. in Olin Arts Center are not the best time and place for quiet study — but they are perfect for quality a cappella. 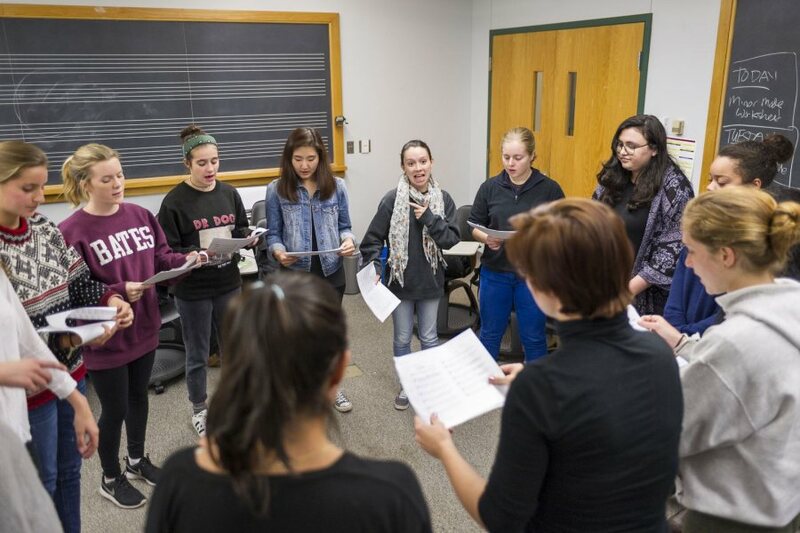 Like their fellow groups, the all-female Merimanders added singers through auditions in early September and are now honing their sound and look for the hugely popular Back to Bates concert on Oct. 7. “During auditions, we’re looking at both voice and character — how we blend and interact with each other,” explains musical co-director Audrey Burns ’17 of Topsham, Maine. Regardless of activity, student groups at Bates have an all-for-one mindset. “It’s such a positive atmosphere that if I ever have a hard day, this is where I need to be,” Burns says. There’s not a Meri who hasn’t at some point arrived at rehearsal feeling blue and yet, a couple hours later, left feeling great, says Emily Tan ’19 of Lexington, Mass.